Although most Ramaria species are thought to be mycorrhizal, this fairly common coral fungus often grows on buried wood, mostly under Beech trees but also in coniferous forests. It’s possible that Upright Coral has a Jeckyll and Hyde lifestyle and that it may be either mycorrhizal or saprophytic. Fairly frequent in Britain and Ireland, Ramaria stricta occurs also throughout mainland Europe, where it is more common in southern countries. This colour-variable coral fungus is found also in several other regions of the world including North America, where it seems to be more common on the western side of the Continental Divide. Upright Coral fungus was described in 1797 by Christiaan Hendrik Persoon, who gave it the scientific name Clavaria stricta. 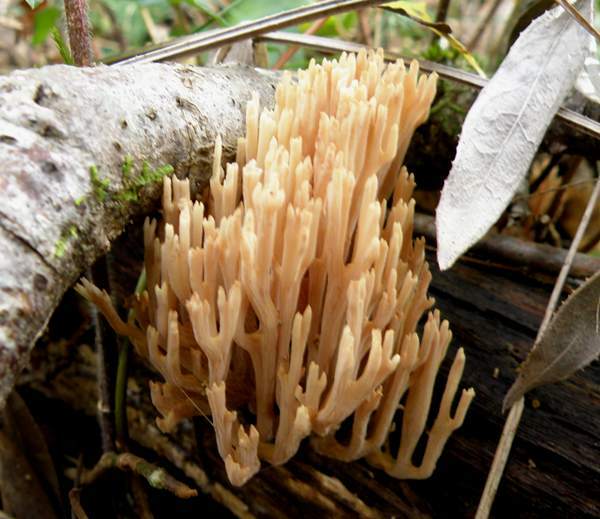 The currently-accepted scientific name of this coral fungus is Ramaria stricta, and it dates from 1888, when the famous French mycologist Lucien Quélet transferred this species to the genus Ramaria. Synonyms of Ramaria stricta include Clavaria stricta Pers., Clavaria condensata Fr., Clavariella condensata (Fr.) P. 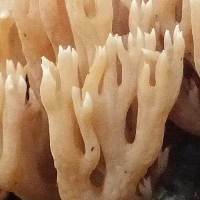 Karst., Ramaria condensata (Fr.) Quél., and Clavaria kewensis Massee. The picture shown above, kindly contributed by Simon Harding, shows Upright Coral growing on the border between a graveyard and a playing field in southern England..
Ramaria, the generic name, comes from Ram- meaning branch, with the suffix -aria meaning posessing or furnished with. 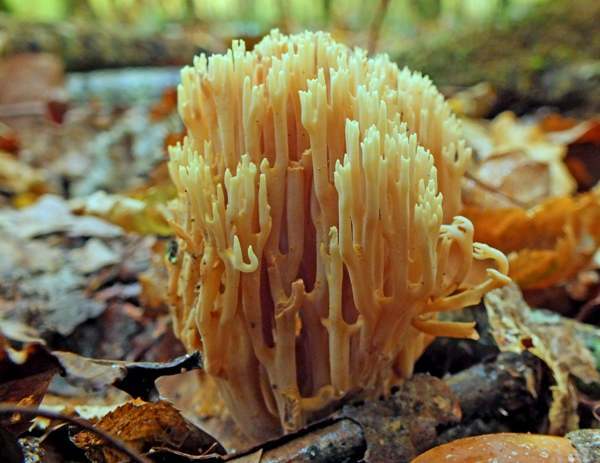 Ramaria coral species are indeed furnished with numerous branches. The specific epithet stricta simply means upright, and although Ramaria stricta branches (in the form of repeated dichotomous forks) all of the branches turn quite sharply to point upwards. 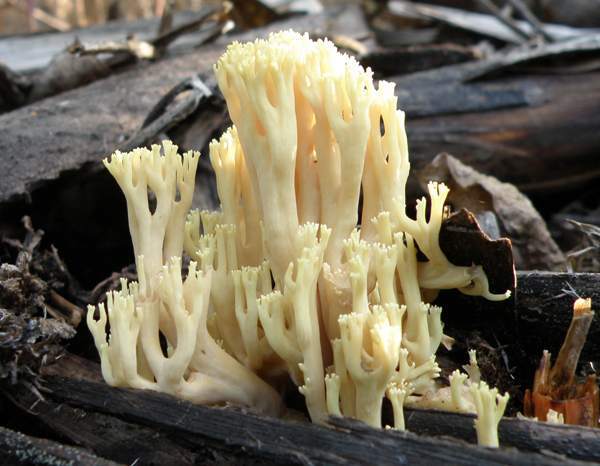 White or pale cream turning buff with age; tough and rubbery coral-like structure with a short base often ‘rooted’ in buried wood; the repeatedly forking, slender upright branches end in sharp tips; surface is smooth, often flattened; spores are produced on the coral surface, which turns wine-red when bruised. 4 to 10cm tall and up to 8cm across the whole fruitbody. 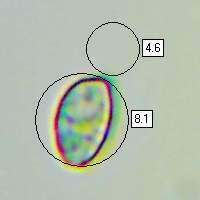 Elongated ellipsoidal or oblong, surface minutely warted, 7-10 x 4-5µm; inamyloid. Mature fruitbodies smell faintly of aniseed; the taste is not significant. Mycorrhizal or saprobic. on stumps or buried wood often under Beeches but also occasionally with conifers. Evidence that Ramaria stricta can sometimes be saprobic rather than mycorrhizal comes from its frequent appearance in flowerbeds and other areas that have been mulched using wood chippings. 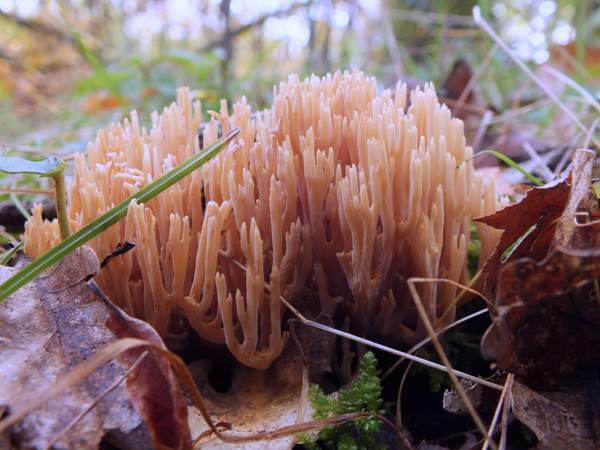 Ramaria formosa is pink or orange and its branches do not turn so immediately upright. Upright Coral is insubstantial and it is generally considered to be inedible. Note also that some coral fungi that look quite similar to Ramaria stricta are known to be poisonous. Pat O'Reilly, Fascinated by Fungi, 2011.